Excitingly, on May 16, 2017, Milpitas City Council in California held a public hearing and adopted the first reading of an Expanded Polystyrene (EPS) foodware ordinance necessary to restrict the provision of EPS foam food service ware and protect public health, safety, and welfare. Both the American Chemistry Council (ACC) and The California Restaurant Association (CRA) submitted letters of opposition to Milpitas Ordinance 293. During a preliminary public hearing on May 2, 2017, a representative of the CRA opposed the ordinance on the grounds that a ban would harm the plastics industry by unfairly targeting a single product unique to food service. Additionally, it was argued that the ban would harm small business owners by preventing food businesses from benefiting from the use of a cheap, recyclable commodity. The ACC and the CRA do not mention that used EPS food items are not recycled. To be clear, EPS is recyclable. Howerver, once the items are soiled, there is no economically or environmentally efficient method available to recycle them On May 12, 2017 New York City reinstituted a ban on EPS food ware after the NYC Sanitation Commissioner issued a Determination explaining why EPS foodware and packaging is not recycled. Without adequate recycling and other capture mechanisms, EPS foodware is very costly to manage and clean up. Water and wind are the primary vectors of EPS plastic pollution in our waterways - carrying the items from our streets and landfills into the watershed. Bans prevent EPS items from being used which prevent them from getting on our streets and into our waterways. Although unincorporated Santa Clara County, and the neighboring cities of Campbell, Fremont, Livermore, Mountain View, Palo Alto, Pleasanton, San Jose and Sunnyvale have implemented bans on EPS foodware items, Milpitas needs to adopt a ban or risk undermining the efforts of neighboring municipalities. Without a ban, EPS foodware items will continue to burden municipalities and tax payers with costly clean up and litter abatement efforts, pollute our waterways, and endanger the health of our environment and ourselves. 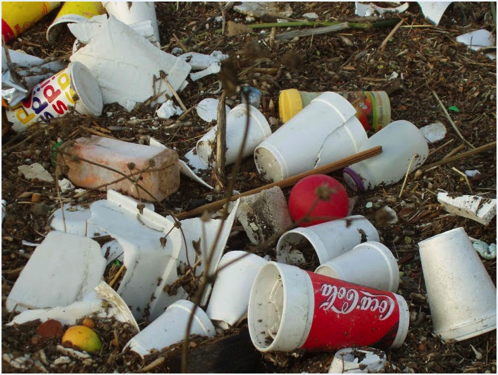 With EPS, the plastics industry has created a commodity that perniciously and ubiquitously pollutes our environment. The price of EPS foodware, although inexpensive to purchase by businesses, is artificially inexpensive. The true price is paid for by the public in addition tothe cost to our environment and public health. If the only means to prevent these harms is through a ban, then a ban does not unfairly target a single industry or commodity. It is also argued that a ban on expanded polystyrene (EPS) foodware is an unfair burden to small businesses because of the cost of replacing EPS items with recyclable or compostable alternatives. However, businesses can offset that cost by simply using reusable food ware items instead of disposable items when their customers dine in. I’ll give you an example. Clean Water Fund’s program, ReThink Disposable, provides free consultation and $300 to small business owners to help them transition from single-use disposable items (like EPS cups) to reusable food ware items. In fact, we worked with 12 businesses here in Santa Clara County and prevented the use of almost 1.5 million disposable food ware items, saving the businesses an average of $6,000 in annual ongoing savings. Milpitas City Council recognized that a ban on EPS food service ware would serve the public’s interest by protecting the health of not only its citizens and environment, but the health of the surrounding communities as well, and adopted the first reading of the ordinance with direction that staff members conduct business outreach to small businesses. The next hearing to adopt a second reading of the ordinance is scheduled for June 20, 2017. Thank you, Milpitas City Council, for standing up to The American Chemistry Council and the California Restaurant Association, and unanimously voting to adopt the first reading of the EPS foam food ware ordinance!